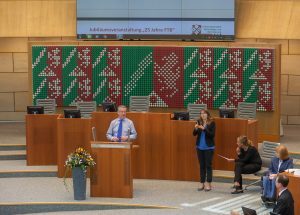 Dr. Peter Cudd, President of AAATE submitted the congratulations of AAATE to FTB and 300 guests including the president of the NRW Parliament and the Social Minister of NRW. FTB one of the founding members of AAATE celebrated its 25th anniversary. 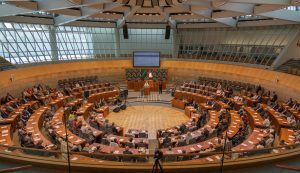 President Dr. Peter Cudd attended the official ceremony in the plenary of the Parliament of Northrhine-Westfalia and delivered the congratulations of the board on behalf of the organisation. 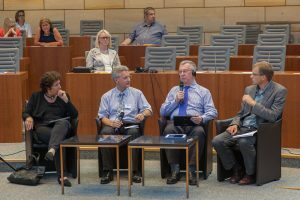 He honoured the contributions of FTB hosting the AAATE 1999 conference alongside REHACARE in Düsseldorf and the important activities during the presidency of Christian Bühler (FTB). During his period the international agreement on cooperation with RESNA and RESJA – the Tokushima Agreement – has been signed and the continuation of EU calls in our research field was achieved. About 300 guests attended the ceremony, which was opened by the President of the Parliament Mrs. Carina Gödeke followed by speeches of the Social Minister Rainer Schmeltzer and the Rectors of the two connected universities Peter Cudd and the head of the NRW disability council (Landesbehindertenrat NRW). Most of the speeches targeted future activities. In the afternoon a thematic conference “Technology for Inclusion and Participation” provided perspectives of user experts with disabilities, service providers, policy and research. It became very obvious that AT and accessibility are appreciated by the experts but need further development and implementation.